Gel Press is "blooming" wonderful! I think I love my ghost print pulls more than the first pull, how about you? Check out my video and please give me "thumbs up" if you liked it remember to subscribe to the Gel Press channel!! DecoArt So Soft fabric paints. 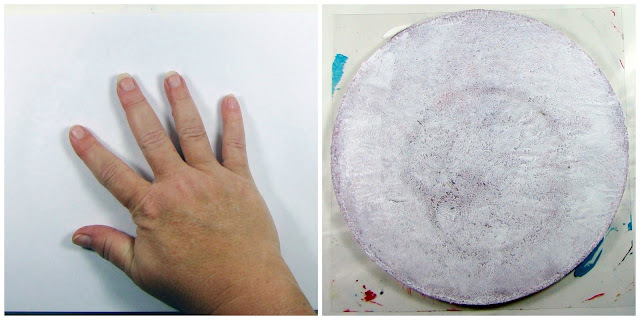 I hope your fly on over to the Gel Press blog and see how it came out. It would make a great summer project to do with the kids and adults alike! They are by DecoArt and if you haven't tried Neon, then may I make a suggestion? Try them, you might like them as much as I do now. Welcome to the Gel Press Earth Day Blog Hop! We want to encourage you to reuse and recycle with Gel Press. Have you thought of making Gel Press Prints on old maps? What about old Christmas cards or even magazines? Hop around and see what our designers have come up with for Earth Day. We will be giving away a prize again for the comments on the Gel Press Blog listing what your favorite project was and why. We will accept comments from April 20 - April 24. 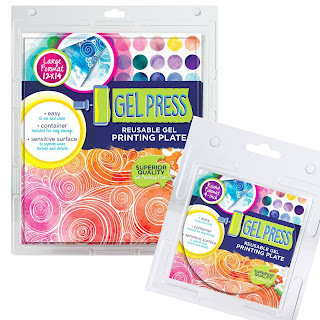 The winner will be announced April 25th on our FB Page and on Gel Press Junkies FB page! Good Luck! I can't wait to see what everyone created! Hi everyone! 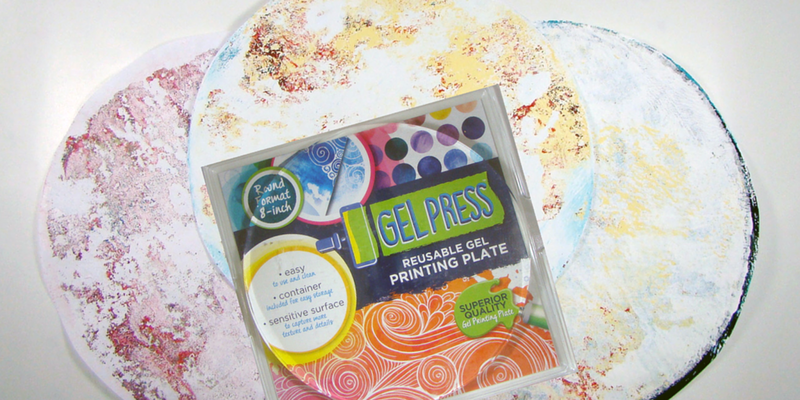 Sandee here today to talk about creating some celestial love for Earth Day with my Gel Press Plates. This is the finished project. 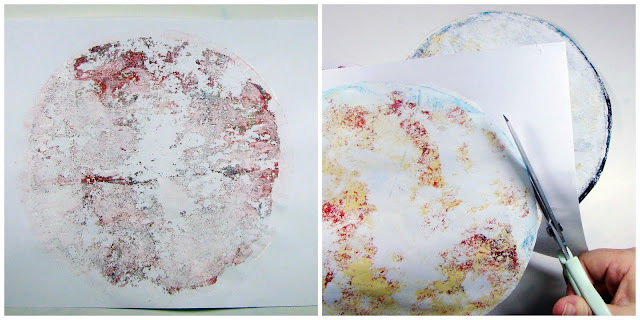 I began making the "planet prints" after I had played around during the day making some random fun prints and this is what my 8' round plate looked like at the end of the day, and this is what you want to start with, a grungy dried up painted plate! 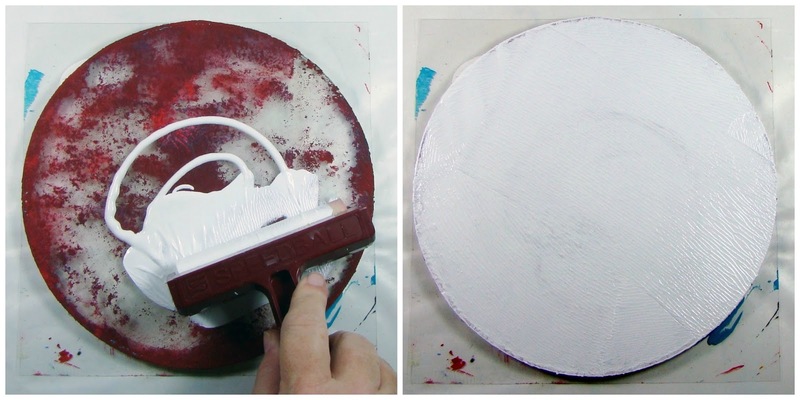 The first step is to cover the plate with a thick coat of paint. 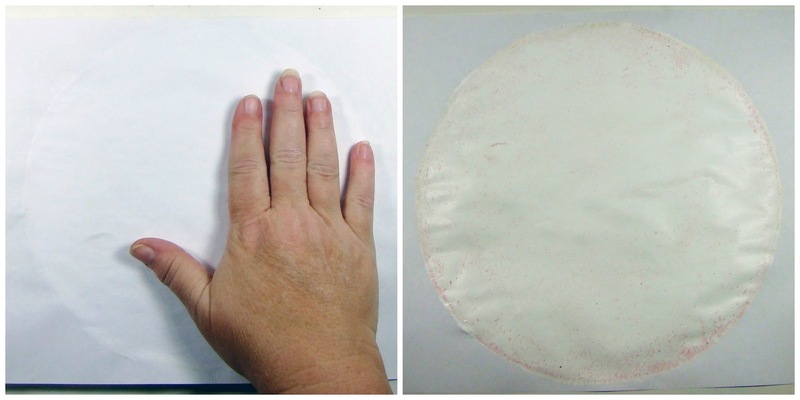 Cover the plate with a piece of paper and gently press down, not too hard, this print is not what you are going to use. The function of this pull is to remove some of the excess paint. It really isn't much to look at but it served it's purpose. You can now see the 2 layers of paint that's left on the plate better. Place a piece of paper over the plate again, but this time press harder! When you pull off the paper you will get a more dramatic print. And this is the print after pulling it off the plate. I had played a lot that day with my plate so I made a couple of cool looking planets and I cut them out to use later. The next step is making a background print for the planet. I added some paint on top of my 12x14" Gel Press plate and used my brayer to create swirls. I was going for the glow from the planet kinda look, and then pulled a print from that. Thanks for looking, and if you’d like more inspiration, you can visit Gel Press on Pinterest or like our Facebook page Gel Press and our fan group Gel Press Junkies.